Guitarist Jeff Parker (a longtime fixture in the Chicago new-Jazz scene, and a member of the seminal group Tortoise) released his album, The New Breed (International Anthem) over the summer to a host of celebration at the time, from The New York Times, The Wall St Journal, Aquarium Drunkard, NPR, and many more. 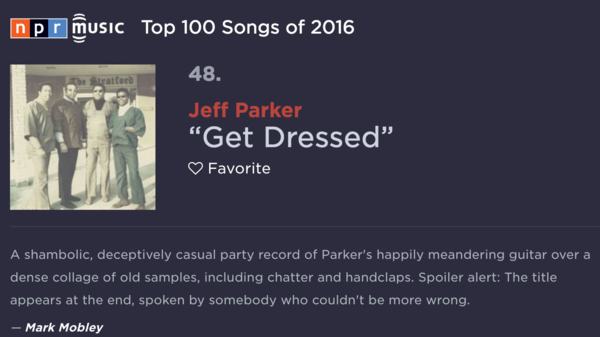 This week, as the Best-Of lists were announced, Parker's record was included in The New York Times' critic Nate Chinen's Top 10 Albums of The Year and NPR's Top 100 Songs of 2016, as well as the Jazz Standard's Best Album's of 2016. "Mr. Parker’s guitar work is nuanced and complex, and the music spans an impressive amount of musical territory with deep and varied grooves." "he made the perfect jazz album." 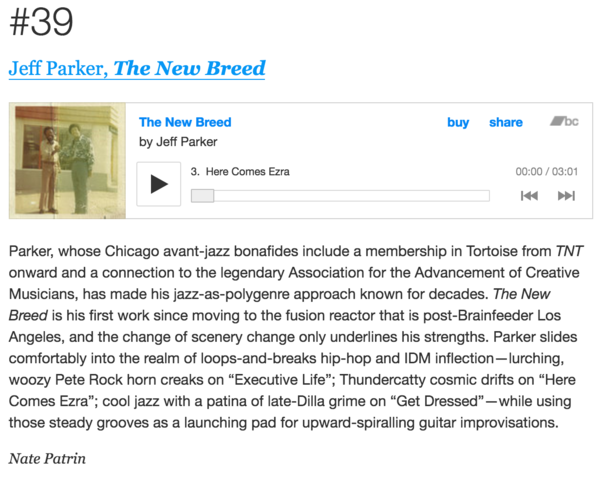 "It’s a killer record — one of our most listened to of the year"
"Jeff Parker‘s The New Breed is timeless"